James “Caff” McHaffie’s list of climbing achievements is something to behold. A vast number of hard, bold routes climbed in excellent style; sport routes past the benchmark 9th grade… it’s not difficult to see why James is regarded as one of Britain’s best climbers. Some highlights from this list include the 3rd ascent of The Very Big and the Very Small (F8b+, Rainbow Slab), a flash ascent of End of the Affair (E8 6c, Curbar), Big Bang (F9a, Lower Pen Trwyn), first ascent The Meltdown (F9a, Dinorwig Quarry), an ascent of Indian Face (E9 6b/c, Cloggy) and Longhope route (originally E11 7a, James suggested E9 7a). Boreal UK: Where do you live? Boreal UK: What’s your background? Boreal UK: What’s your job? Boreal UK: What does that involve? 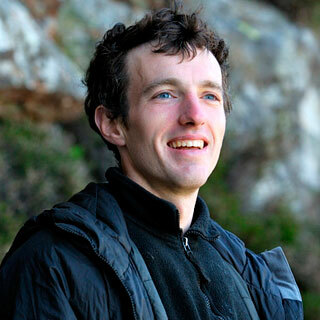 James: Varies from Night navigating and walking about for a week with a heavy bag and camping kit to guiding routes like Positron or other welsh classics. Boreal UK: How & why did you start climbing? James: I liked the movement in the climbing wall and got my dad to take me outdoors, he was always a keen climber, we did Troutdale Pinnacle and I was hooked! Boreal UK: What type of climbing do you enjoy most? James: Maybe arêtes and cracks. Boreal UK: Where is your favourite place to climb? James: UK trad venues, lots of variety and compare well with the el cap routes! Boreal UK: Do you have a favourite route? James: I couldn’t pick one. Muir Wall, El Cap as it was a wild last night climbing the 2nd crux by head torch on pitch 33 with Hazel and Dyer. Conan the Librarian at Gogarth, and Freemasonry for covering obscenely exposed and wild sea cliff terrain and adventure. Bitter Oasis, Goat Crag in the Lakes and Left wall, Cromlech. I could go on and on. They’re all brilliant routes in great places which I’ve great memories of. Boreal UK: Who (if anyone) do you admire in climbing / who has inspired you? James: Many close friends have inspired me over the years, from people like Pete Robins, Neil Dickson, Emma Twyford, Hazel Findlay, Ben Bransby , Ryan Pasquill. Also the previous generation, Ron Fawcett, Pete Whillance, Pete Livesey, Joe Brown, Johnny Dawes etc. James: Dharma for sport, Lynx for trad. Boreal UK: What is the future of climbing? James: Toddlers will take over on sport climbing and bouldering, but won’t be able to carry a rack nor want to, the trend is already there. I come from a similar viewpoint from Pete Livesey. I think sport climbing alone lacks the adventure and character of the trad routes. The now popular bouldering wasn’t even seen as climbing 20 years ago, who would have guessed that now it’s all many climbers do? James: I want to tick all the Extreme Rock climbs sometime next year. I’d like to do Rainshadow, Megalopa and Liquid Ambar this year. I’d like to give La Rambla a good go and polish off the hard slate routes in Twll Mawr. Boreal UK: What makes you happy? James: A good climb, beer and book after a great weeks work. Boreal UK: What is important to you? James: Family, friends, a bit of alone time and general fairness eg Im a big believer in NHS, looking after poor pensioners and people in poverty. Climate change is another biggy, which is what I studied for a few years. It’s a depressing state of affairs. Boreal UK: What’s the best piece of advice you could give? James: Whatever you really love to do go for it, work hard at your work and studies, and always know you can do anything you put your mind to. The harder you work towards a goal the more you appreciate it, whether it’s achieved or not.